One summer during a spiritual and personal growth houseboat retreat, I was teaching at Lake Powell, Page, Arizona, I anchored a 50-foot houseboat near the sandy beach far into the lake at an isolated cove. Our group of 16 participants observed one very large pair of Cougar paw prints about 4 inches wide. This is about the width of an adult hand. There also were two sets of small kitten prints imbedded in the soft wet sand. In the late afternoon, I was jogging at the top of a steep cliff and as I rounded a curve, I saw a large 100lb female Cougar sitting at the top off a bluff. Her torso was a cinnamon buff-colored contrasted by a white belly. She had two kittens with brownish-black irregular spots on the body and dark rings on the short tail. I had read that they can jump as far as 40 feet in one leap and as high as 15 feet from the ground. This was disconcerting as I was only about 45 feet away below her. I figured one leap would bring us together. I slowed to a fast walk and decided to pass in front rather than turning around as she maintained attentive eye contact. I did not know if I could continue around the bluff or would have to return the way that I came. I had not yet read that it was not wise to maintain eye contact with a Cougar. Then, one eager kitten began bounding down the hill toward me as the other kitten cautiously moved near the mom. Without losing eye contact with me, the momma Cougar crouched and gave a single loud, blood-curdling hair-raising cry that sounded like a woman screaming in pain. The kitten continued toward me with an over the shoulders look at mom. She then reluctantly turned around about 15 feet from me, and scampered back up the hill. The magnificent mother Cougar cried a soft whistle and gently lay down as I moved safely out of sight and continued on a path that led down the cliff to the houseboat. 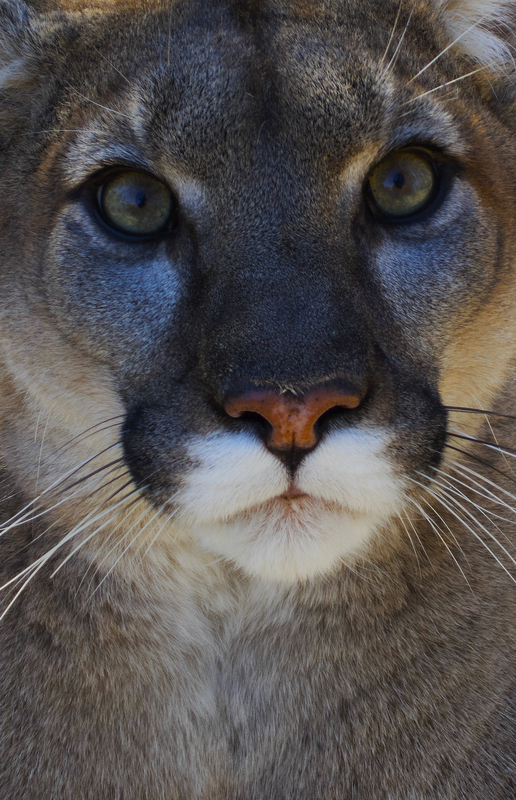 During my long jogs, deep in the Arizona forests, I occasionally observed Cougars watching from large boulders high above me, and more than 100 feet away. Each time I calmly connected eye-to-eye with the Cougar and slowed to a brisk walk, which appeared to resolve any conflict. After years of wildlife photography (unfortunately no Cougars), it may be the naturalist in me to establish a visual connection and softly talk to them as I make my way through their territory. Perhaps, the advice not to engage in direct eye contact with a Cougar is an appropriate behavior and I support this if intuitively it makes sense. Nonetheless, I believe that a non-threatening compassionate connection with our animal neighbors is wise whenever possible. Each year sport hunters, farmers and vehicle accidents kill Cougars. Three week ago a a hit and run driver killed a young Cougar on a main highway in Prescott, Arizona not far from a lake I frequently hike and photograph. The effects of habitat loss is dramatic for increasing more opportunities for cougar/human encounters. This entry was posted in Nature Writing and tagged Cougar paw prints, eye contact, Lake Powell. When a mommy cougar is distressed from a potential threat to her baby, the thing to do is have immediate compassion because they pick up on our emotions? Then it would make sense to me if someone was defensive or fearful from her cry and wanted to fight back, then maybe she would pick up on this emotion and possibly attack. Jana, I value and appreciate your thoughts. From my many years as a wildlife photographer I do believe that with a few exceptions, animals sense our emotional balance and respond or react accordingly. Stephen your Blog was entertaining as well as informative intuitively inspirational reminding that we communicate with emotions more honestly. Love respect and being peaceful, as Gandhi said, is our best course of actions. Thanks for reminding me through your colorful tale. Thank you for your response to my post about Cougars at Lake Powell. I am pleased that the post is a reminder of sharing love, respect and being peaceful with wildlife and humans.